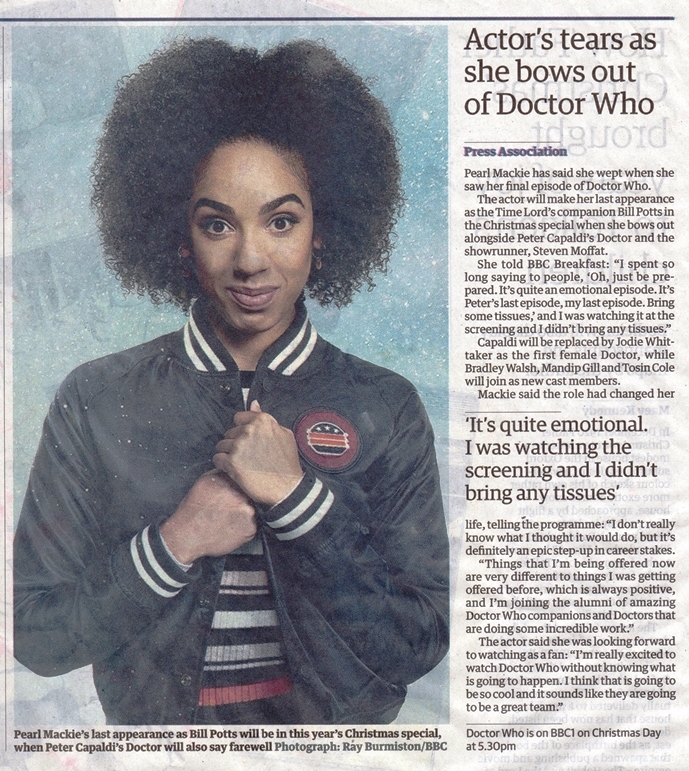 Pearl Mackie has said she wept when she saw her final episode of Doctor Who. The actor will make her last appearance as the Time Lord's companion Bill Potts in the Christmas special when she bows out alongside Peter Capaldi's Doctor and the showrunner, Steven Moffat. Capaldi will be replaced by Jodie Whittaker as the first female Doctor, while Bradley Walsh, Mandip Gill and Tosin Cole will join as new cast members. Mackie said the role had changed her life, telling the programme• "I don't really know what I thought it would do, but it's definitely an epic step-up in career stakes. APA 6th ed. : (2017-12-20). Actor's tears as she bows out of Doctor Who. Press Association . MLA 7th ed. : "Actor's tears as she bows out of Doctor Who." Press Association [add city] 2017-12-20. Print. Turabian: "Actor's tears as she bows out of Doctor Who." Press Association, 2017-12-20, section, edition. This page was last modified on 30 March 2019, at 03:08.